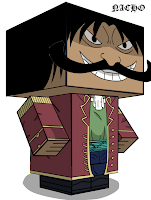 The One Piece Gol D 300x300 The One Piece Gol D. Roger The Pirate King Cube Craft Free DownloadThis cube craft paper model is the Gol D. Roger, based on the Anime/manga series One Piece, this paper toy was designed by blackignus. Gol D. Roger, known to most as Gold Roger, was the Pirate King, captain of the Roger Pirates, and owner of the legendary treasure known as “One Piece”. He was also the lover of Portgas D. Rouge and biological father of Portgas D. Ace.